This article is about the region. For the magazine, see Hudson Valley (magazine). The Hudson Valley (also known as the Hudson River Valley) comprises the valley of the Hudson River and its adjacent communities in the U.S. state of New York, from the cities of Albany and Troy southward to Yonkers in Westchester County. Depending upon the definition delineating its boundaries, the Hudson Valley encompasses a growing metropolis which is home to between 3 and 3.5 million residents centered along the north-south axis of the Hudson River. The Hudson River valley runs primarily north to south down the eastern edge of New York State, cutting through a series of rock types including Triassic sandstones and redbeds in the south and much more ancient Precambrian gneiss in the north (and east). In the Hudson Highlands, the river enters a fjord cut during previous ice ages. To the west lie the extensive Appalachian highlands. In the Tappan Zee region, the west side of the river has high cliffs produced by an erosion-resistant diabase; these cliffs range from 400–800 feet in height. The Hudson Valley is one physiographic section of the larger Ridge-and-Valley province, which in turn is part of the larger Appalachian physiographic division. The northern portions of the Hudson Valley fall within the Eastern Great Lakes and Hudson Lowlands Ecoregion. During the last ice age, the valley was filled by a large glacier that pushed south as far as Long Island. Near the end of the last ice age, the Great Lakes drained south down the Hudson River, from a large glacial lake called Lake Iroquois. Lake Ontario is the remnant of that Lake. Large sand deposits remain from where Lake Iroquois drained into the Hudson; these are now part of the Rome Sand Plains. Was Hudson valley named after Henry Hudson? The Hudson Valley was inhabited by indigenous peoples ages before Europeans arrived. The Algonquins lived along the Hudson River, with the three subdivisions of that group being the Lenape (also known as the Delaware Indians), the Wappingers, and the Mahicans. The lower Hudson River was inhabited by the Lenape Indians. In fact, the Lenape Indians were the people that waited for the explorer Giovanni da Verrazzano onshore, traded with Henry Hudson, and sold the island of Manhattan. Further north, the Wappingers lived from Manhattan Island up to Poughkeepsie. They lived a similar lifestyle to the Lenape, residing in various villages along the river. They traded with both the Lenape to the south and the Mahicans to the north. The Mahicans lived in the northern valley from present-day Kingston to Lake Champlain, with their capital located near present-day Albany. The Lenape, the Wappingers, and the Mahicans were speakers of languages that were part of Algonquin language family. As such, the three subdivisions were able to communicate with each other. Their relations with each other were mostly peaceful. However, the Mahicans were often in direct conflict with the Mohawk Indians to the west, which was a part of the Iroquois nation. The Mohawks would sometimes raid Mahican villages from the west. The Algonquins in the region lived mainly in small clans and villages throughout the area. One major fortress was called Navish, which was located at Croton Point, overlooking the Hudson River. Other fortresses were located in various locations throughout the Hudson Highlands. Villagers lived in various types of houses, which the Algonquins called Wigwams. The houses could be circular or rectangular. Large families often lived in longhouses that could be a hundred feet long. At the associated villages, the indigenous peoples grew corn, beans, and squash. They also scavenged for other types of plant foods, such as various types of nuts and berries. In addition to agriculture, they also fished for food in the river, focusing on various species of freshwater fish, as well as several variations of striped bass, sturgeon, herring, and shad. Oyster beds were also common on the river floor, which provided an extra source of nutrition. Land hunting consisted of turkey, deer, rabbits, and other animals. In 1497, John Cabot traveled along the coast and claimed the entire country for England; he is credited with the Old World's discovery of continental North America. In 1524, Florentine explorer Giovanni da Verrazzano visited the bay of New York, in service of Francis I of France. On his voyage, Verrazzano sailed north along the Atlantic seaboard, starting in the Carolinas. Verrazzano sailed all the way to New York Harbor, which he thought was the mouth of a major river. Verrazzano sailed his boat into the harbor and possibly sailed over what is now Battery Park (Battery Park was created with landfill). However, Verrazzano never sailed up the Hudson River and left the harbor shortly thereafter. A year later, Estevan Gomez, a Portuguese explorer sailing for Spain in search of the Northwest Passage visited New York Bay. The extent of his explorations in the bay is unknown. Yet as Charles H. Winfield has noted, as late as 1679, there was a tradition among the First Nations that the Spanish arrived before the Dutch, and that from them it was that the natives obtained the maize or Spanish wheat. Maps of that era based on Gomez's map labeled the coast from New Jersey to Rhode Island, as the "land of Estevan Gomez". In 1598 some Dutch employed by the Greenland Company wintered in the Bay. Eleven years later, the Dutch East India Company financed English navigator Henry Hudson in his attempt to search for the Northwest Passage. During this attempt, Henry Hudson decided to sail his ship up the river that would later be named after him. As he continued up the river, its width expanded, into Haverstraw Bay, leading him to believe he had successfully reached the Northwest Passage. He docked his ship on the western shore of Haverstraw Bay and claimed the territory as the first Dutch settlement in North America. He also proceeded upstream as far as present-day Troy before concluding that no such strait existed there. After Henry Hudson realized that the Hudson River was not the Northwest Passage, the Dutch began to examine the region for potential trading opportunities. Dutch explorer and merchant Adriaen Block led a voyage up the lower Hudson River, the East River, and out into Long Island Sound. This voyage determined that the fur trade would be profitable in the region. As such, the Dutch established the colony of New Netherland. The Dutch settled three major outposts: New Amsterdam, Wiltwyck, and Fort Orange. 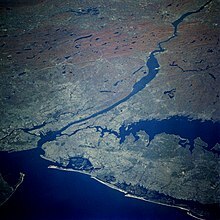 New Amsterdam was founded at the mouth of the Hudson River, and would later become known as New York City. Wiltwyck was founded roughly halfway up the Hudson River between New Amsterdam and Fort Orange. That outpost would later become Kingston. Fort Orange was the outpost that was the furthest up the Hudson River. That outpost would later become known as Albany. New Netherland and its associated outposts were set up as fur-trading outposts. The Dutch attempted to form a trade alliance with the Mahicans, angering the Mohawk nation and provoking hostilities between the two tribes. The Natives began to trap furs at a quicker pace and then sold them to the Dutch for luxuries. This trade would eventually deplete the supply of those animals in their territory, decreasing the food supply in the process. The focus on furs also made the Natives economically dependent on the Dutch for trade. The Dutch West India Company operated a monopoly on the region for roughly twenty years before other businessmen were allowed to set up their own ventures in the colony. New Amsterdam quickly became the colony's most important city, operating as its capital and its merchant hub. The other outposts functioned as settlements in the wilderness. At first, the colony was made up of mostly single adventures looking to make money, but over time the region transitioned into maintaining family households. New economic activity in the form of food, tobacco, timber, and slaves was eventually incorporated into the colonial economy. In 1647, Director-General Peter Stuyvesant took over management of the colony. He found the colony in chaos due to a border war with the English along the Connecticut River, and Indian battles throughout the region. Stuyvesant quickly cracked down on smuggling and associated activity before expanding the outposts along the Hudson River, especially Wiltwyck at the mouth of Esopus Creek. Stuyvesant attempted to establish a fort midway up the Hudson River. However, before that could be done, the British invaded New Netherland via the port of New Amsterdam. Given that the city of New Amsterdam was largely defenseless, Stuyvesant was forced to surrender the city and the colony to the British. New Amsterdam and the overall colony of New Netherland was renamed New York, after the Duke of York. The Dutch regained New York temporarily, only to relinquish it again a few years later, thus ending Dutch control over New York and the Hudson River. Under British colonial rule, the Hudson Valley became an agricultural hub, with manors being developed on the east side of the river. At these manors, landlords rented out land to their tenants, letting them take a share of the crops grown while keeping and selling the rest of the crops. Tenants were often kept at a subsistence level so that the landlord could minimize his costs. They also held immense political power in the colony due to driving such a large proportion of the agricultural output. Meanwhile, land west of Hudson River contained smaller landholdings with many small farmers living off the land. A large crop grown in the region was grain, which was largely shipped downriver to New York City, the colony's main seaport, for export back to Great Britain. In order to export the grain, colonial merchants were given monopolies to grind the grain into flour and export it. Grain production was also at high levels in the Mohawk River Valley. During the French and Indian War in the 1750s, the northern end of the valley became the bulwark of the British defense against French invasion from Canada via Lake Champlain. The Hudson River was a key river during the Revolution. The Hudson River was important for a few reasons. Firstly, the Hudson's connection to the Mohawk River allowed travelers to get to the Great Lakes and the Mississippi River eventually. In addition, the river's close proximity to Lake George and Lake Champlain would allow the British navy to control the water route from Montreal to New York City. In doing so, the British, under General John Burgoyne's strategy, would be able to cut off the patriot hub of New England (which is on the eastern side of the Hudson River) and focus on rallying the support of loyalists in the South and Mid-Atlantic regions. The British knew that total occupation of the colonies would be unfeasible, which is why this strategy was chosen. As a result of the strategy, numerous battles were fought along the river, including several in the Hudson Valley. George Washington's Continental Army had retreated north to White Plains, New York in 1776, as the British pursued him and his army. While the British advanced towards him, Washington decided to take a stand in White Plains. In October 1776, Howe's army advanced from New Rochelle, and Scarsdale. Washington set up defensive positions in the hills around the village. When the British attacked, the British managed to break the Continental's defenses at Chatterton Hill, now known as Battle Hill. Once the British managed to reach the top of the hill, Washington was forced to retreat. The main positive for Washington after this battle was that he managed to avoid being enveloped by the British Army. Washington ordered his men to retreat across the Hudson River, eventually reaching New Jersey and Pennsylvania. Because Washington was able to preserve what was left of his army, this retreat would eventually lead to the successful surprise attacks on Trenton, New Jersey and Princeton, New Jersey in December of the same year. Fort Washington in Upper Manhattan later fell after this retreat. Once Washington retreated to Pennsylvania, New England militias had to fortify the Hudson Highlands, a choke point on the river north of Haverstraw Bay. As a result, the Continentals started building Fort Clinton on the other side of the river from Fort Montgomery. In the year 1777, Washington expected General Howe to sail his army north to Saratoga in order to meet up with General Burgoyne. This would result in the Hudson River being sealed off. However, Howe surprised Washington by sailing his army south to Philadelphia, conquering the Patriot capital. Washington was out of position and sought to defend Philadelphia, but to no avail. Meanwhile, Howe left Sir Henry Clinton in charge of a smaller force to be docked in New York City, with the permission to strike the Hudson Valley at any time. On October 5, 1777, Clinton's army did so. At the Battle of the Hudson Highlands, Clinton's force sailed up the Hudson River and attacked the twin forts. Along the way, the army looted and pillaged the village of Peeksill. The Continentals fought hard at the battle, but they were badly outnumbered and were fighting in unfinished forts. Washington's men were caught between defending Philadelphia and defending the Hudson Valley. In the end, the British took the fort, as well as taking Philadelphia around the same time. However, Clinton and his men returned to New York City soon afterward. The Continentals later decided to build the Great West Point Chain in order to prevent another British fleet from sailing up the Hudson River in a similar manner as during the previous battle. The chain that was by the forts was simply circumvented by the British army via attacking on the shores. The new chain, designed by engineer Captain Thomas Machin, could have theoretically been lowered in order to let friendly ships sail down the river, but the chain was never tested, and was later discarded after the war. 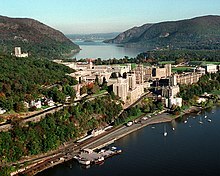 The United States Military Academy on the Hudson River at West Point was established in 1802. Following the building of the Erie Canal, the area became an important industrial center. The canal opened the Hudson Valley and New York City to commerce with the Midwest and Great Lakes regions. However, in the mid 20th century, many of the industrial towns went into decline. The first railroad in New York, the Mohawk and Hudson Railroad, opened in 1831 between Albany and Schenectady on the Mohawk River, enabling passengers to bypass the slowest part of the Erie Canal. The Hudson Valley proved attractive for railroads, once technology progressed to the point where it was feasible to construct the required bridges over tributaries. The Troy and Greenbush Railroad was chartered in 1845 and opened that same year, running a short distance on the east side between Troy and Greenbush, now known as East Greenbush (east of Albany). The Hudson River Railroad was chartered the next year as a continuation of the Troy and Greenbush south to New York City, and was completed in 1851. In 1866 the Hudson River Bridge opened over the river between Greenbush and Albany, enabling through traffic between the Hudson River Railroad and the New York Central Railroad west to Buffalo. When the Poughkeepsie Bridge opened in 1889, it became the longest single-span bridge in the world. The New York, West Shore and Buffalo Railway began at Weehawken Terminal and ran up the west shore of the Hudson as a competitor to the merged New York Central and Hudson River Railroad. Construction was slow, and was finally completed in 1884; the New York Central purchased the line the next year. During the Industrial Revolution, the Hudson River became a major location for production. The river allowed for fast and easy transport of goods from the interior of the Northeast to the coast. Hundreds of factories were built around the Hudson, in towns including Poughkeepsie, Newburgh, Kingston, and Hudson. The North Tarrytown Assembly (later owned by General Motors), on the river in Sleepy Hollow, was a large and notable example. The river links to the Erie Canal and Great Lakes, allowing manufacturing in the Midwest, including automobiles in Detroit, to use the river for transport. (pp71–2) With industrialization came new technologies for transport, including steamboats for faster transport. In 1807, the North River Steamboat (later known as Clermont), became the first commercially successful steamboat. It carried passengers between New York City and Albany along the Hudson River. Tourism became a major industry as early as 1810. With convenient steamboat connections in New York City, and numerous attractive hotels in romantic settings, tourism became an important industry. Early guidebooks were providing suggestions on their itinerary. Middle-class people who read James Fenimore Cooper's novels, or saw the paintings of the Hudson River School, were especially attracted. In 1965, governor Nelson Rockefeller proposed the Hudson River Expressway, a limited-access highway from the Bronx to Beacon. An 8-mile section was built from Ossining to Peekskill, now part of U.S. Route 9; the rest of the highway was never built due to local opposition. 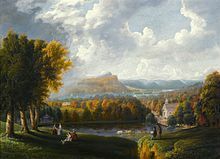 In the early 19th century, popularized by the stories of Washington Irving, the Hudson Valley gained a reputation as a somewhat gothic region inhabited by the remnants of the early days of the Dutch colonization of New York (see, e.g., The Legend of Sleepy Hollow). The area is associated with the Hudson River School, a group of American Romantic painters who worked from about 1830 to 1870. Hudson River School paintings reflect three themes of America in the 19th century: discovery, exploration, and settlement. The paintings also depict the American landscape as a pastoral setting, where human beings and nature coexist peacefully. Hudson River School landscapes are characterized by their realistic, detailed, and sometimes idealized portrayal of nature, often juxtaposing peaceful agriculture and the remaining wilderness, which was fast disappearing from the Hudson Valley just as it was coming to be appreciated for its qualities of ruggedness and sublimity. In general, Hudson River School artists believed that nature in the form of the American landscape was an ineffable manifestation of God, though the artists varied in the depth of their religious conviction. They took as their inspiration such European masters as Claude Lorrain, John Constable and J. M. W. Turner. Their reverence for America's natural beauty was shared with contemporary American writers such as Henry David Thoreau and Ralph Waldo Emerson. The Düsseldorf school of painting had a direct influence on the Hudson River School. The school characterizes the artistic body, its New York location, its landscape subject matter, and often its subject, the Hudson River. While the elements of the paintings were rendered realistically, many of the scenes were composed as a synthesis of multiple scenes or natural images observed by the artists. In gathering the visual data for their paintings, the artists would travel to extraordinary and extreme environments, which generally had conditions that would not permit extended painting at the site. During these expeditions, the artists recorded sketches and memories, returning to their studios to paint the finished works later. The artist Thomas Cole is generally acknowledged as the founder of the Hudson River School. Cole took a steamship up the Hudson in the autumn of 1825, the same year the Erie Canal opened, stopping first at West Point, then at Catskill landing. He hiked west high up into the eastern Catskill Mountains of New York State to paint the first landscapes of the area. The first review of his work appeared in the New York Evening Post on November 22, 1825. At that time, only the English native Cole, born in a landscape where autumnal tints were of browns and yellows, found the brilliant autumn hues of the area to be inspirational. Cole's close friend, Asher Durand, became a prominent figure in the school as well. Painters Frederic Edwin Church and Albert Bierstadt were the most successful painters of the school. On October 3, 2009 the Poughkeepsie-Highland Railroad Bridge reopened as the Walkway over the Hudson. It is a pedestrian walkway over the Hudson River that opened as part of the Hudson River Quadricentennial Celebrations, and it connects over 25 miles of existing pedestrian trails. The main laboratory building of the IBM Watson Research Center is located in Yorktown Heights. Tech Valley is a marketing name for the eastern part of New York State, including the Hudson Valley and the Capital District. Originated in 1998 to promote the greater Albany area as a high-tech competitor to regions such as Silicon Valley and Boston, it has since grown to represent the counties in New York between IBM's Westchester County plants in the south and the Canada–US border to the north. The area's high technology ecosystem is supported by technologically focused academic institutions including Rensselaer Polytechnic Institute and the State University of New York Polytechnic Institute. Tech Valley encompasses 19 counties straddling both sides of the Adirondack Northway and the New York Thruway, and with heavy state taxpayer subsidy, has experienced significant growth in the computer hardware side of the high-technology industry, with great strides in the nanotechnology sector, digital electronics design, and water- and electricity-dependent integrated microchip circuit manufacturing, involving companies including IBM in Armonk and its Thomas J. Watson Research Center in Yorktown, GlobalFoundries in Malta, and others. Westchester County has developed a burgeoning biotechnology sector in the 21st century, with over US$1 billion in planned private investment as of 2016, earning the county the nickname Biochester. The Hudson Valley is one of the oldest winemaking and grape-growing regions in the United States, with roots established as early as 1677, and has experienced a resurgence in viticulture in the 21st century. Many wineries are located in the Hudson Valley, offering wine-tasting and other tours. Numerous wine festivals are held in the Hudson Valley, with themes often varying by season. Rhinebeck is home to the Hudson Valley Wine & Food Fest, hosted at the Dutchess County Fairgrounds. The Hudson Valley is divided into three regions: Upper, Middle, and Lower. The following is a list of the counties within the Hudson Valley sorted by region. The Lower Hudson Valley is typically considered part of the Downstate New York region due to its geographical and cultural proximity to New York City. Major interstates in the Hudson Valley include Interstate 87 (part of the New York State Thruway), a small section of Interstate 95 in Southeastern Westchester County, Interstate 287 serving Westchester and Rockland Counties, Interstate 84 serving Putnam, Dutchess, and Orange Counties, and Interstate 684 serving Westchester and Putnam Counties. parkways in the region include the Bronx River Parkway, the Cross County Parkway, the Hutchinson River Parkway, the Sprain Brook Parkway, and the Saw Mill River Parkway serving solely Westchester County, the Taconic State Parkway serving Westchester, Putnam, Dutchess, and Columbia Counties, and the Palisades Interstate Parkway serving Rockland and a very small portion of southwestern Orange County. New York State Route 17 operates as a freeway in much of Orange County and will be designated Interstate 86 in the future. Hudson River crossings in the Hudson Valley region from south to north include the Tappan Zee Bridge between South Nyack in Rockland County and Tarrytown in Westchester County, the Bear Mountain Bridge between Cortlandt in Westchester County and Stony Point in Rockland County, the Newburgh-Beacon Bridge between Newburgh in Orange County and Beacon in Dutchess County, the Mid-Hudson Bridge between Poughkeepsie in Dutchess County and Highland in Ulster County, the Kingston-Rhinecliff Bridge between Rhinecliff in Dutchess County and Kingston in Ulster County, and the Rip Van Winkle Bridge between Hudson in Columbia County and Catskill in Greene County. The Walkway Over the Hudson is a pedestrian bridge which parallels the Mid-Hudson Bridge and was formerly a railroad bridge. Commuter rail service in the region is provided by Metro-North Railroad (operated by the Metropolitan Transportation Authority). Metro-North operates three rail lines east of the Hudson River to Grand Central Terminal in Manhattan, from east to west they are the New Haven Line (serving southeast Westchester County), the Harlem Line (serving Central and Eastern Westchester, Putnam, and Dutchess Counties), and the Hudson Line (serving western Westchester, Putnam, and Dutchess Counties). West of the Hudson, New Jersey Transit operates two lines rail service under contract with Metro-North Railroad to Hoboken Terminal: the Pascack Valley Line (serving central Rockland County) and the Port Jervis Line (serving western Rockland County and Orange County). Amtrak serves Yonkers, Croton-Harmon, Poughkeepsie, Rhinecliff-Kingston, and Hudson along the eastern shores of the Hudson River, as well as New Rochelle in southeastern Westchester County. NY Waterway operates the Haverstraw-Ossining Ferry between Haverstraw in Rockland County and Ossining in Westchester County, as well as ferry service between Newburgh in Orange County and Beacon in Dutchess County. Intercity and commuter bus transit are provided by Rockland Coaches in Rockland County, Short Line in Orange and Rockland Counties, and Leprechaun Lines in Orange and Dutchess Counties. There are also several local bus providers, including the Bee-Line Bus System in Westchester County and Transport of Rockland in Rockland County. The Hudson Valley is served by two airports with commercial airline service: Westchester County Airport (HPN) near White Plains and Stewart International Airport (SWF) near Newburgh. The Hudson Valley Renegades is a minor league baseball team affiliated with the Tampa Bay Rays. The team is a member of the New York–Penn League and plays at Dutchess Stadium in Fishkill. The Rockland Boulders of the independent Can-Am League play in Rockland County. Kingston Stockade FC is a soccer team representing the Hudson Valley in the National Premier Soccer League (NPSL), a national semi-professional league at the fourth tier of the American Soccer Pyramid. They compete in the North Atlantic conference of the NPSL's Northeast region, and began their first season in May 2016. ^ "Mountains, Valleys and the Hudson River". Hudson Valley Tourism. 2009. Retrieved 2011-09-29. ^ Van Diver, B.B. 1985. Roadside Geology of New York. Mountain Press, Missoula. p. 59-63. ^ "Physiographic divisions of the conterminous U. S." U.S. Geological Survey. Retrieved 2007-12-06. ^ Eyles, N. Ontario Rocks: Three Billion Years of Environmental Change. Fitzhenry & Whiteside, Markham, Ontario. 339 p.
^ a b c d e f Alfieri, J.; Berardis, A.; Smith, E.; Mackin, J.; Muller, W.; Lake, R.; Lehmkulh, P. (June 3, 1999). "The Lenapes: A study of Hudson Valley Indians" (PDF). Poughkeepsie, New York: Marist College. Retrieved May 25, 2017. ^ a b c d e f Levine, David (June 24, 2016). "Hudson Valley's Tribal History". Hudson Valley Magazine. Retrieved May 24, 2017. ^ "Giovanni Verrazano". timesmachine.nytimes.com. New York Times. September 15, 1909. Retrieved March 28, 2016. ^ Cleveland, Henry R. "Henry Hudson Explores the Hudson River". history-world.org. International World History Project. Retrieved February 3, 2015. ^ a b c d e f "Dutch Colonies". nps.gov. National Park Service. Retrieved June 26, 2016. ^ Varekamp, Johan Cornelis; Varekamp, Daphne Sasha (Spring–Summer 2006). "Adriaen Block, the discovery of Long Island Sound and the New Netherlands colony: what drove the course of history?" (PDF). Wrack Lines. Retrieved June 11, 2017. ^ a b Rink, Oliver A. (1986). Holland on the Hudson: An Economic and Social History of Dutch New York. Ithaca, New York: Cornell University Press. pp. 17–23, 264–266. ISBN 978-0801495854. Retrieved June 26, 2016. ^ a b c Roberts, Sam (August 25, 2014). "350 Years Ago, New Amsterdam Became New York. Don't Expect a Party". New York Times. Retrieved June 26, 2016. ^ a b c Leitner, Jonathan. "Transitions in the Colonial Hudson Valley: Capitalist, Bulk Goods, and Braudelian". Journal of World-Systems Research. 22 (1): 214–246. Retrieved January 4, 2017. ^ Mansinne, Jr., Major Andrew. "The West Point Chain and Hudson River Obstructions in the Revolutionary War" (PDF). desmondfishlibrary.org. Desmond Fish Library. Retrieved March 8, 2016. ^ Carroll, John Martin; Baxter, Colin F. (August 2006). The American Military Tradition: From Colonial Times to the Present (2nd ed.). Lanham, Maryland: Rowman and Littlefield Publishers, Inc. pp. 14–18. ISBN 9780742544284. Retrieved March 8, 2016. ^ "The Battle of White Plains". www.theamericanrevolution.org. TheAmericanRevolution.org. Retrieved March 9, 2016. ^ a b Borkow, Richard (July 2013). "Westchester County, New York and the Revolutionary War: The Battle of White Plains (1776)". Westchester Magazine. Retrieved March 10, 2016. ^ a b Ayers, Edward L.; Gould, Lewis L.; Oshinky, David M.; Soderlund, Jean R. (2009). American Passage: A History of the United States (4th ed.). Boston, MA: Wadsworth, Cengage Learning. ISBN 9780547166292. ^ Mark, Steven Paul (November 20, 2013). "Too Little, Too Late: Battle Of The Hudson Highlands". Journal of the American Revolution. Retrieved March 10, 2016. ^ Harrington, Hugh T. (September 25, 2014). "he Great West Point Chain". Journal of the American Revolution. Retrieved March 10, 2016. ^ Randall, Willard Sterne (1990). Benedict Arnold: Patriot and Traitor. William Morrow and Inc. pp. 522–523. ISBN 1-55710-034-9. ^ a b Lossing, Benson John (1852). The Pictorial Field-book of the Revolution. Harper & Brothers. ^ Stanne, Stephen P., et al. (1996). The Hudson: An Illustrated Guide to the Living River, p. 120. Rutgers University Press. ISBN 0-8135-2271-4. ^ Hirschl, Thomas A.; Heaton, Tim B. (1999). New York State in the 21st Century. Greenwood Publishing Group. pp. 126–128. ISBN 0-275-96339-X. ^ "The Hudson River Guide". www.offshoreblue.com. Blue Seas. Retrieved March 4, 2016. ^ Harmon, Daniel E. (2004). "The Hudson River". Chelsea House Publishers. Retrieved June 23, 2016. ^ Hunter, Louis C. (1985). A History of Industrial Power in the United States, 1730–1930, Vol. 2: Steam Power. Charlottesville, Virginia: University Press of Virginia. ^ "Governor Signs River Road Bill; Overrides Protests Against Hudson Expressway". The New York Times. May 30, 1965. Retrieved June 26, 2016. ^ Dunwell, Francis F. (2008). The Hudson: America's river. Columbia University Press. p. 100. ISBN 978-0-231-13641-9. ^ Kornhauser, Elizabeth Mankin; Ellis, Amy; Miesmer, Maureen (2003). Hudson River School: Masterworks from the Wadsworth Atheneum Museum of Art. Wadsworth Atheneum Museum of Art. p. vii. Retrieved June 26, 2016. ^ "The Panoramic River: the Hudson and the Thames". Hudson River Museum. 2013. p. 188. ISBN 978-0-943651-43-9. Retrieved June 23, 2016. ^ "The Hudson River School: Nationalism, Romanticism, and the Celebration of the American Landscape". Virginia Tech History Department. Retrieved June 26, 2016. ^ Nicholson, Louise (January 19, 2015). "East meets West: The Hudson River School at LACMA". Apollo. Retrieved June 23, 2016. ^ Oelschlaeger, Max. "The Roots of Preservation: Emerson, Thoreau, and the Hudson River School". Nature Transformed. National Humanities Center. Retrieved June 26, 2016. ^ Marter, Joan (2011). The Grove Encyclopedia of American Art. New York, NY: Oxford University Press. pp. 112–113. ISBN 978-0-19-533579-8. Retrieved June 26, 2016. ^ a b Avery, Kevin J. (October 2004). "The Hudson River School". Heilbrunn Timeline of Art History. New York: The Metropolitan Museum of Art. Retrieved June 26, 2016. ^ a b O'Toole, Judith H. (2005). Different Views in Hudson River School Painting. Columbia University Press. p. 11. ^ Boyle, Alexander. "Thomas Cole (1801-1848) The Dawn of the Hudson River School". Hamilton Auction Galleries. Retrieved 19 December 2012. ^ "Asher B. Durand". Smithsonian American Art Museum: Renwick Gallery. Smithsonian Museum. Retrieved June 26, 2016. ^ a b "About Tech Valley". Tech Valley Chamber Coalition. Archived from the original on 2008-11-03. Retrieved 2009-09-27. ^ a b Larry Rulison (July 10, 2015). "Made in Albany: IBM reveals breakthrough chip made at SUNY Poly". Albany Times-Union. Retrieved July 12, 2015. ^ Keshia Clukey (June 27, 2014). "Better than advertised: Chip plant beats expectations". Albany Business Review. Retrieved July 20, 2015. ^ Freeman Klopott; Xu Wang; Niamh Ring (September 27, 2011). "IBM, Intel Start $4.4 Billion in Chip Venture in New York". 2011 Bloomberg. Retrieved July 12, 2015. ^ "The Roots of American Wine since 1677". HUDSON VALLEY WINE COUNTRY.ORG. Retrieved October 26, 2015. ^ "The Roots of American Wine since 1677 - Calendar of Festivals and Events". HUDSON VALLEY WINE COUNTRY.ORG. Retrieved October 26, 2015. Donaldson Eberlein, Harold; Van Dyke Hubbard, Cortlandt (1942). Historic houses of the Hudson valley. New York: Architectural Book Pub. Co. OCLC 3444265. Historic Hudson Valley (1991). Visions of Washington Irving: Selected Works From the Collections of Historic Hudson Valley. Tarrytown, New York: Historic Hudson Valley. ISBN 978-0-912882-99-4. Howat, John K. (1972). The Hudson River and Its Painters. New York: Viking Press. ISBN 978-0-670-38558-4. Jacobs, Jaap and L.H. Roper (eds.) (2014). The Worlds of the Seventeenth-Century Hudson Valley. Albany, New York: State University of New York Press. Marks, Alfred H. (1973). Literature of the Mid Hudson Valley: A Preliminary Study. New Paltz, New York: Center for Continuing Education, State University College. OCLC 1171631. McMurry, James; Jones, Jeff (1974). The Catskill Witch and Other Tales of the Hudson Valley. Syracuse, New York: Syracuse University Press. ISBN 978-0-8156-0105-0. Mylod, John (1969). Biography of a River: The People and Legends of the Hudson Valley. New York: Hawthorn Books. OCLC 33563. Scheltema, Gajus and Westerhuijs, Heleen (eds. ),Exploring Historic Dutch New York. New York: Museum of the City of New York/Dover Publications, 2011. Talbott, Hudson (2009). River of Dreams: The Story of the Hudson River. New York: G. P. Putnam's Sons. ISBN 978-0-399-24521-3. Vernon, Benjamin. The History of the Hudson River Valley (New York: Overlook, 2016. xiv, 625 pp. Wallkill Valley Publishing Association (1904). The Historic Wallkill and Hudson River Valleys. Walden, New York: Wallkill Valley Publishing Association. OCLC 13418978. Wharton, Edith (1929). Hudson River Bracketed. New York: D. Appleton & Company. OCLC 297188. Wilkinson Reynolds, Helen (1965). Dutch houses in the Hudson Valley before 1776. New York: Dover Publications. OCLC 513732.